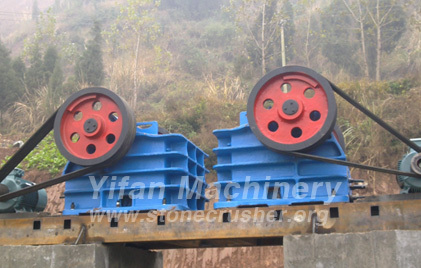 Yifan Machinery developed a new jaw crusher. The jaw crusher broken than large, up to 15 to 20, crushing, high efficiency, less wear and tear lining. Traditional jaw crusher broken compared to 2 ~ 3.5 times than increasing production capacity increased by 10%, power consumption reduced by 10% to 20%, Overall height reduced by 20%, jaw crusher liner to 3 times more life expectancy. Mineral production in the rational application of these new high-performance low-power dressing equipment, improving the rational utilization of mineral resources, save energy and reduce consumption has a practical significance.